Let me tell you who Jason was. He could light up a room with just a smile. He could make you laugh no matter what mood you were in. He would keep after you until you did laugh. So many times I would be upset at him for something and he would keep pushing at me until I couldn’t help but laugh. He was one of the most giving people, with what he had and of himself. If anyone asked him for help with anything, he was always there. Jason has a sister, “Chris.” She is 12 years older than him. She always felt the need to protect him. Being her little brother she would always tease him and try to make him mad. The day came when he was taller and bigger than she was. She started with the teasing and he picked her up and tossed her onto the couch. The teasing stopped that day. Jason was always big for his age, but he had such a calm and quiet personality about him, unless he was on the football field all was different. People would always come up to us and ask us how could such a quiet, polite and respectful kid be such a beast on the field, we had no answer. The other thing he found he liked as much as football was lifting weights. It made him a better football player. His last couple of years of high school, if he wasn’t playing football he was in the weight room lifting weights. After school was done and football was over, Jason seemed a little lost not knowing what he wanted to do with his life. A friend introduced him to an Army recruiter and, after talking to him, decided he wanted to join the Army. 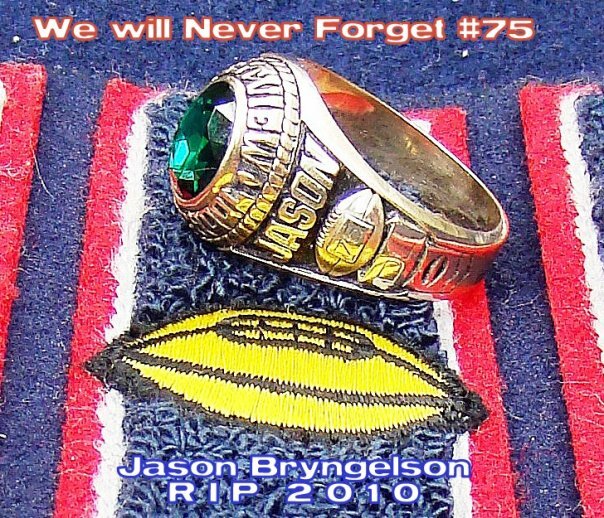 On February 22, 2010, the day Jason was supposed to sign the final paperwork, he passed away. We still don’t understand everything that happened. It also seemed like the doctors didn’t know what had happened. We returned to his room, knowing that we had to make a decision about keeping him alive with the machines or turning them off and letting him go. I have never made a more difficult decision in my life, but we needed to do what was best for Jason, so we decided to turn the machines off. He was given a shot for pain. The doctor explained it was given to all patients coming off life support to make sure they’re in no pain at all. I remember how quiet it was in his room. It wasn’t long after the shot was given that they started to back off on the machines until they were completely off. He was gone, I held on to him crying, asking him to open his eyes and come back to me. I’d lost my baby, my son. I didn’t know what to do next. I was completely lost. The following day, Jason’s very first football coach and good friend came to the house (Jason had kept in touch with him for years after playing for him). He started to inform us about the Concussion Legacy Foundation and the work they do along with Boston University, the testing for brain injuries and trying to find ways to make sports safer to play. 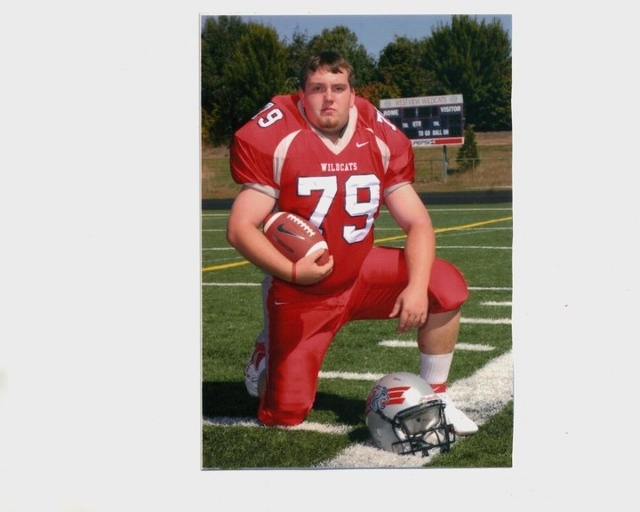 He explained to us that they had never had a donor of Jason’s age that had played football as long as he played—Jason always played a lineman, whether it was offense or defense, he was always a lineman. Being a lineman helmets would be crashing almost every play. We always knew Jason wanted to be an organ donor, but because he had multiple organ failure, most of his major organs could not be used. We were saddened by this but we understood. When we were told about the institute and the work they do we knew right away that this would be something Jason would want. Any way he could help to make the game of football safer—the game he loved to play safer for kids and adults—he would jump at the chance. Memories…you have good ones and you have bad ones. You find that you remember the good and the bad just float away. You take all the good memories and lock them away in your heart, because that’s all you have left. Jason touched so many lives and had so many friends. I know we only had him for 19 years, but I thank God every day we had those. As parents we spend years trying to teach our children the right values in life. You know how they are at home, but how are they are outside the home? We were always told over and over about how polite and caring he was to others, and always so respectful. We know we had one of the best sons anyone could ever ask for. We will always be proud to say we are Jason’s parents. Being his mom I will sit alone and talk to him knowing he hears me feeling the love in my heart staying strong and growing with every conversation. He will always have a special part of my heart forever.